What is a CE Compliance Transcript? Know exactly what courses you need to take to be renewal ready. 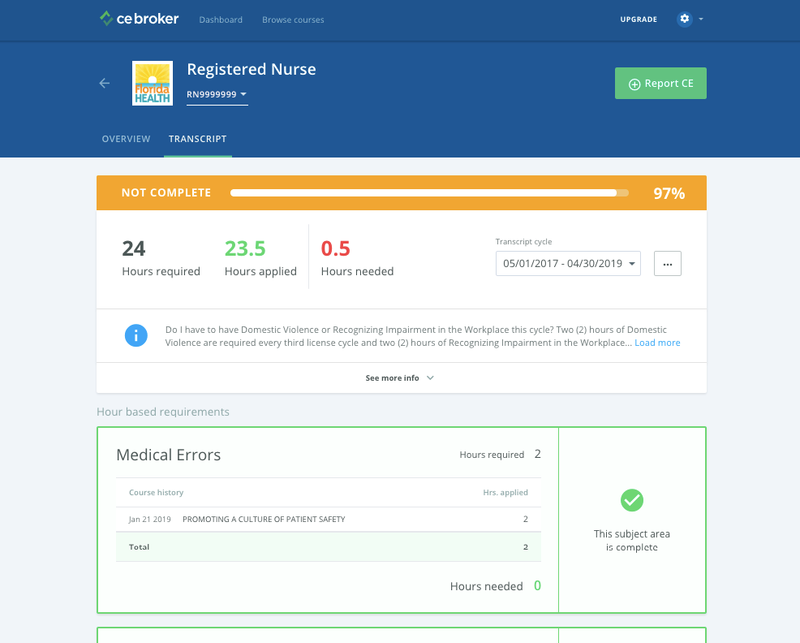 Available to Professional and Concierge account members only, your CE Compliance Transcript is the quickest way to know what your requirements are, what courses have been reported for you, and what you still need to complete. Once all of your requirements have been fulfilled, your Transcript will read Complete and you can enjoy the peace of mind that your license will be renewed with ease. If it reads Not Complete, check the hours needed for your required subject areas to pinpoint what hours are missing. The Transcript also includes a visual gauge of progress, and a "Did You Know" section with helpful hints about your renewal requirements.